Translated from French, Fleur de lis means lily flower, but this elegant wine bottle stopper really translates into a real favor bargain! It has all the beauty of the symbol it prominently features on the top of each bottle stopper. 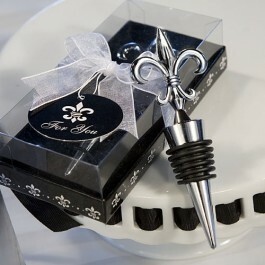 The bottle stopper is nicely boxed with a clear lid and tied with a white organza bow and attached Fleur de lis "For You" tag. Measures 4.5" x 1.5" x .5"